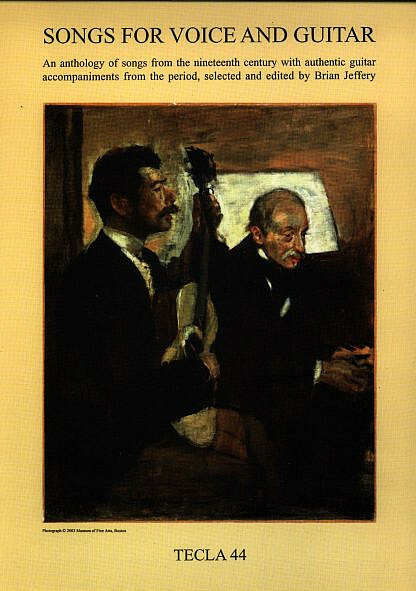 A treasure-house of songs from the nineteenth century, with guitar accompaniments from their own time, not modern arrangements. Songs for Voice and Guitar presents 33 songs with guitar accompaniment, all of them newly edited from the original editions by Brian Jeffery. Anyone who sings with guitar or who accompanies a singer will find a wealth of music here: the 33 songs range from English 19th century ballads to arrangements of Schubert songs by Napoleon Coste, to French romances, while among the most exciting are six Central and South American songs from about 1830, of which the two Mexican, “El Vejuquito” and “El Pan de Jarabe”, are full of life. These are original songs with guitar, not modern arrangements, all of them newly edited from the original sources and nearly all of them published here for the first time. Some of the accompaniments are easy, some moderate, some a bit harder. Re-engraved (not facsimile). 104 pages. 12 x 9 inches. First published by Tecla Editions in 1985, reprinted 2005. Read the complete introduction. Gives many details about songs with guitar in the 19th century, and detailed notes about all the songs in this book. Copyright 2005 by Tecla Editions. Errors and omissions excepted.